The Bombay Royale are dedicated to bringing music and mayhem of vintage Indian cinema back to the future, where it belongs. 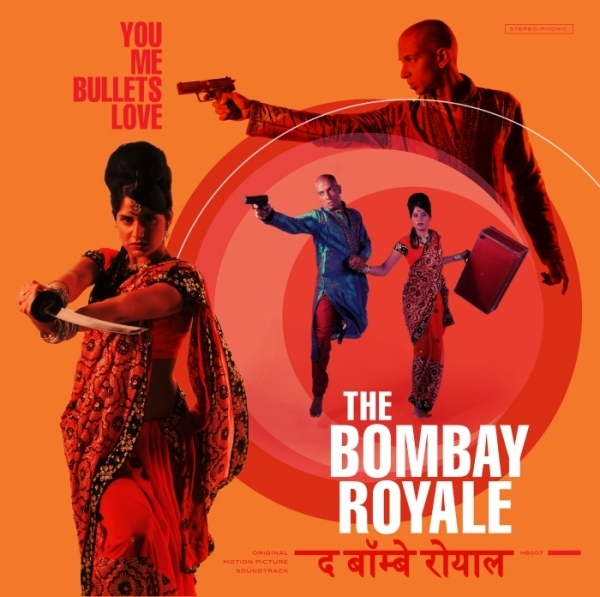 Their debut album ‘You Me Bullets Love’ is a blend of haunting Hindi and Bengali vocals, pulsing deep funk and disco breaks and shimmering surf-a-delica. Expect huge horn riffs, wild spaghetti guitar, bustling tabla, screaming organs and all the synthesizers, sitars and strings that made the music of 1960s and 1970s Bollywood so electrifying. Starring vocalists Parvyn Kaur Singh as ‘The Mysterious Lady’ and Shourov Bhattacharya as ‘The Tiger’, ‘You Me Bullets Love’ is the soundtrack to a story of espionage, excitement, extended dance sequences and the eternal power of true love. The golden age of Bollywood was a riot of saturated colour and dramatic excess and the music that accompanied it was unmatched in bizarre experimentation, deep sophistication and outright funky badness: a treasure trove for sample hungry hiphop heads and secretive, vinyl-obsessed funk collectors. Musical director Andy Williamson (“The Skipper”) formed The Bombay Royale to bring the hidden musical gems of that lost era out into the light. The originators, people like R.D Burman, Asha Bhosle and Mohammed Rafi are still household names in India, but largely unknown in the outside world. The Bombay Royale is here to rectify that situation. ‘You Me Bullets Love’ is for the neophytes and enthusiasts alike, a combination of vibrant original material and vintage Hindi super hits.